We recently celebrated the first birthday of our move to Te Ahu, the multifunctional community centre that is gaining recognition around New Zealand and the world. Enjoy the short video above giving a brief overview of this beautiful space where I work. 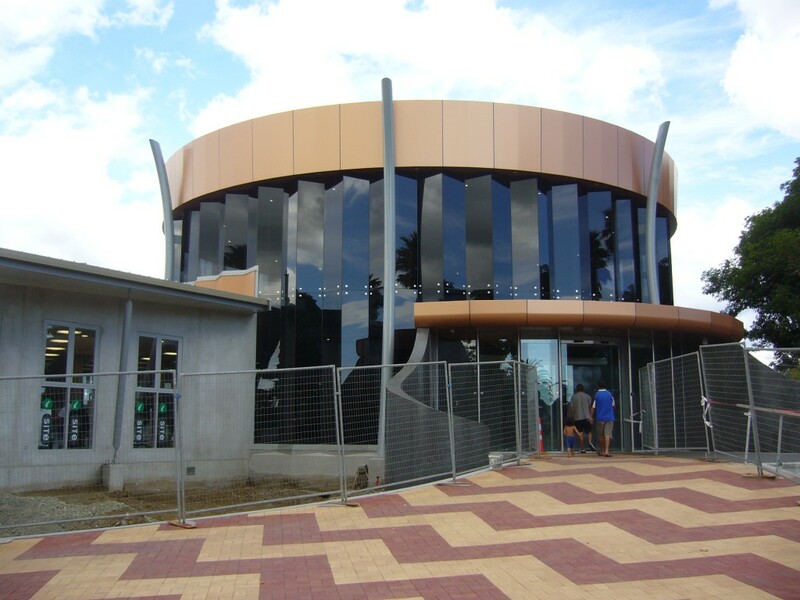 I was blissfully ignorant of many of the nuances of our new Te Ahu complex and corralled Mark Osborne to gain a little more insight I could pass on to those visitors wishing to know more. The following information is gleaned from a very quick walk-through with Mark and further conversations with Alan Simpkin and Roger Gale (who gave much appreciated detail on two large tree specimens outside the main entrance). We in the library are really pleased with our first two weeks. We’ve seen many new and old faces and signed up a number of new patrons. Saturday, the 18th was our biggest Saturday ever with 500 people through the door in four hours, easily eclipsing our previous record of 400 one Saturday in the middle of 2011 during the Duffy book programme. Similarly, weekday door counts are at all-time highs. Despite being unbelievably busy, we’re enjoying the overwhelmingly positive response from visitors to the library. I’ve personally heard two different visitors mention they thought the atrium felt like a cathedral. The atrium was entirely conceived and designed locally in a collaborative effort of Richard Murray of Image Nation, Paul Marshall of Paul Marshall Arts and Alan Simpkin and Doug Beard of Arcline Design. The original idea had been to put the pou in a line and Paul Marshall came up with the concept of placing them in a circle, giving each represented group equal measure. Brilliant, don’t you think! There are currently three pou in place. Peter Griffiths carved the European one, Paul Marshall has done Te Rarawa and it is my understanding that Te Puia (a National Arts and Crafts consortium are responsible for the Ngati Kuri pou. Four more pou representing Te Aupouri, Ngai Takoto, Ngati Kahu and people of Dalmatian descent will stand alongside the current pou when they are completed. 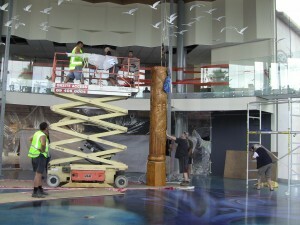 is anticipated that two more will be unveiled around the time of Matariki in June. The remaining two are not expected to be completed until 2013. The rolled steel beams at the street entrance to the atrium represent the meeting of the two seas – the Tasman and the Pacific. The floor of the atrium is the sea floor, with the ray correlating to the North Island. Please note the map of the Far North in the tail of the ray, visible from the second level of the atrium. 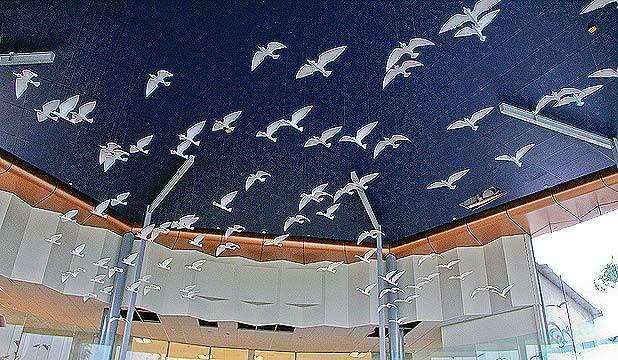 More than 100 perspex kuaka (bar-tailed godwits) hang from the ceiling of the atrium in a flight formation that mimics the migratory bird’s annual journey to the northern hemisphere. Steve La Hood headed a team from Wellington-based Story Inc in the interior design of the library and the Far North Regional Museum. Story Inc computer generated the Kupe panels in the library while the forest scene was produced by the Far North’s Paul Marshall. The tree and suspension bridge are proving very popular with young visitors to the library. Fell Engineering of Haruru Falls did the steel work for the tree. Human Dynamic of Wellington took moulds from a live kauri tree in order to create the authentic bark on our tree. One young child peering up at the leaves of the tree, exclaimed, “Look Mom, giant lily pods.” Close! Speaking of trees, the beautiful, large tree by the Matthews Avenue entrance is an Erythrina cross. It has pale orange flowers, unlike the red of the closely related coral trees (more often called flame trees), ubiquitous winter-blooming spiny trees of the north). The yellow-flowering acacia-like spreading tree is a Brazilian rosewood or Tipuana Tipu.